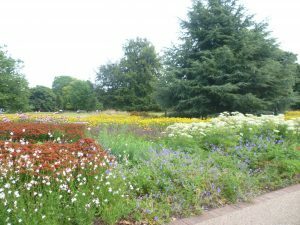 In June this year, Kew Garden’s newly-designed summer herbaceous borders in the famous Broad Walk opened to the public, and they are sensational. 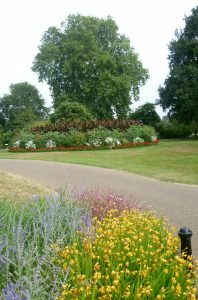 There are more than 27,000 flowering plants on show. At 320 metres long, it is the longest double herbaceous border in the country – and possibly in the world. 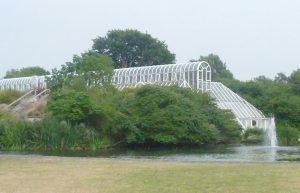 The Broad Walk was originally laid out by William Nesfield in 1845-6 to link the Orangery to the newly-built Palm House. Nesfield’s Broad Walk was created as a promenade with large cedars and rhododendrons and formal bedding. A late 19th century photograph shows ladies with tip-tilted hats and gentlemen wearing straw hats (considered shocking as they were thought worryingly ‘classless’). In spite of the summer hats, I get the impression that the ‘informality’ is only skin deep. The trees and bushes cast a heavy shade and the flower beds are formal. Good manners are surely expected here. 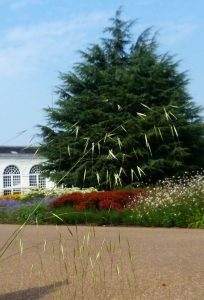 The modern planting by Richard Wilford, as you can see, is much looser, and the borders are continuous instead of being confined within box-hedged diamonds and circles as they were back in the 1890s. 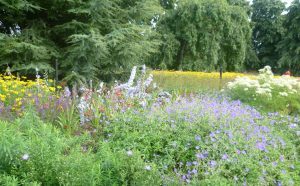 I love the way that the planting has plainly been designed with bees in mind – there is a constant buzzing around the flowers – and butterflies dance around. I tried to take a poetic shot of this bit of the walk seen through an attractive grass stem, but, alas, you’ll have to peer to see the effect. 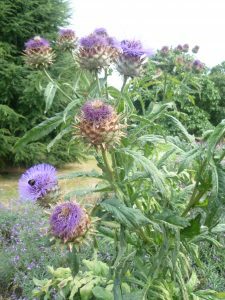 The flowers Richard Wilford has chosen are also planted informally; many of them look not that far removed from wild flowers and this gives the border as sort of democracy: these flowers have always been around. They may have a message for us: the bees love us, we are useful medically or in some other way and you need to cherish us. As if to prove my point: the flowers above look like the proletarians of the flower world. I’m sure the Victorians would think them too untidy and, possibly, not knowing their place. I doubt they’d have been allowed in a late Victorian border. Kew Gardens, of course, always was dedicated to adding to our knowledge of the science of botany but now, with climate change and the increasing threat to bio-diversity, the importance of valuing the entire plant world, no matter how humble, is ever more apparent, and the newly-planted Broad Walk demonstrates this. 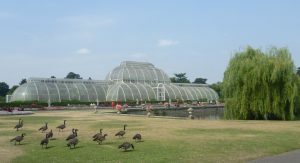 I really enjoyed my visit to Kew Gardens. 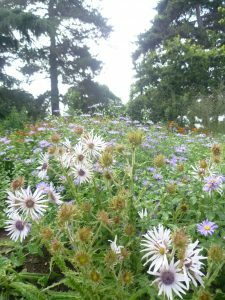 There is always, of course, a huge amount to see but in August, oddly enough, there is not much in the way of flowers outside the various glass houses. The trees and bushes are in heavy summer leaf but the blossom is long over, the berries not yet ripe, and the ground itself is dry and parched. 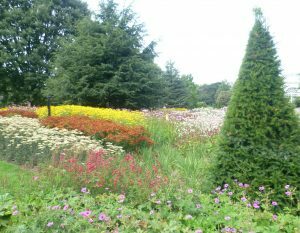 The Broad Walk borders provide a welcome shot of colour. Very interesting post. Those borders look fantactic. Very cottage-garden, but on a grand scale! That’s a good image, Jan – cottage-gardeny. You’re right. It could be samey, but it isn’t. I think it’s partly that it’s so long (320 metres) and, at the beginning of the walk, you can’t see the end. And it varies, too. 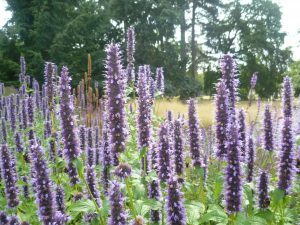 There’s a bee-loving section; a flowers that are medicinal section and so on, so there’s plenty of variety. They are gorgeous. Haven’t been for years. Neither had I, Elizabeth. When I got out my old Welcome to Kew leaflet, it was dated 1996! There was no website address and an Annual Season ticket cost £18, just slightly more than it cost me to get in for a single visit. The 1996 map of the gardens is much clearer than the 2016 one, though there are an some modern additions, like the Princess of Wales conservatory, which are missing. There are lots of places I didn’t get to, like the Treetop Walkway, which I’d love to see, so I hope to go back without waiting another 20 years!